In the 110 years since the Sixteenth Amendment authorized the personal income tax, we have created an expensive and burdensome monster with tentacles in our systems for welfare, health care, and education, and in the private business of citizens. Consider some data provided by our federal government. There were 150M tax returns filed, about one for every 2.2 persons. That makes sense for a population of about 330M and with tax returns often being for households/families rather than just for individuals. 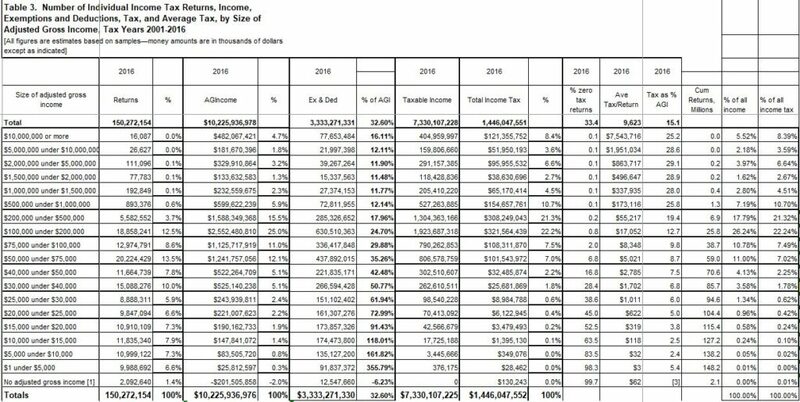 Total adjusted gross income reported was $10.2 trillion dollars, an average of about $68,000 per return. The median income, half higher and half lower, was in the $30,000 to $40,000 bracket. On a per capita basis, this defines the so-called Middle Class. That is a large and disturbing difference between the average and the median. Returns showing AGI less than $30,000, below Middle Class, accounted for only 7% of the AGI and 1.4% of income tax collected. Married couples filing separately with incomes less than $5.00. ?? And to top off the complications, Social Security doesn’t count or gets reduced depending on other income. This is just a hint at how complicated the tax code is! What if a flat tax of 10% on all AGI below $100,000, 15% on all AGI between $100,000 and $500.000 and 20% on all AGI above $500,000, with no exemptions, exclusions, deductions or credits (and no entanglement with the ACA or welfare or education) were charged, the total collected would have been almost exactly the same as collected under the current absurdly complex system but with no tax returns required except for self employed folks and businesses. For most of us, the correct taxes would be withheld from our pay and pensions and dividends and capital gains, and that would be the end of the process. Same rate on everything. No game playing and picking of winners and losers. The IRS would shrink. Congress would have to quit playing games with special favors for some groups and punishments for others and would have to tell all of us when they were raising taxes and how much and why. For most of us, tax returns would not be on post cards. They would be non-existent. Even those millions not paying now would get the 10% deducted from all but Social Security. And, yes, I would have had to pay a little more. But I would have suffered much less hassle, would have been more carefree, and could have spent more time doing something worthwhile. And perhaps the national debt would have grown less. And Congress could have spent more time on critical issues and less time fiddling with the tax code in search of votes. And, by the way, the same simplification is needed on corporate taxes: just a flat 15% rate on profits reported to the public, no exemptions, exclusions, deductions, credits, or allowances. Period. For those who prefer charts and tables over words, below are some that can be used to craft other proposals. This chart shows data for about 20 different income brackets. 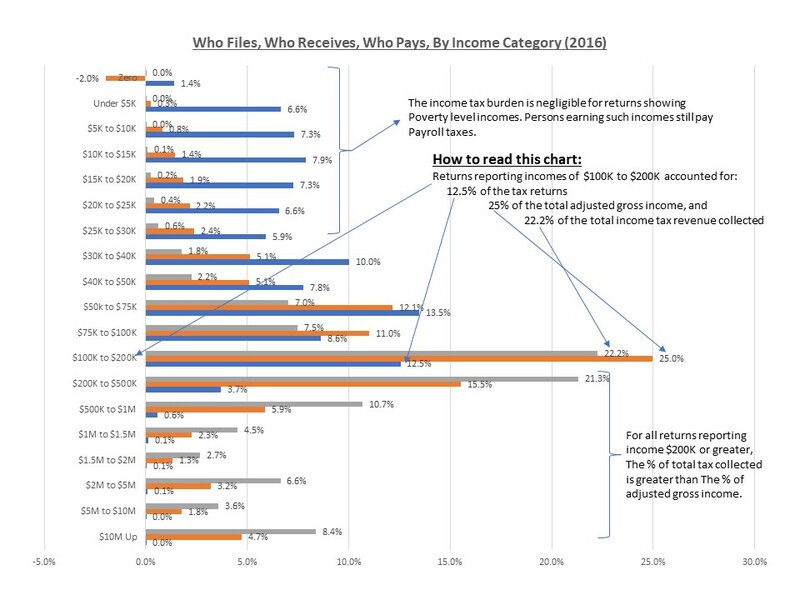 Included are percent of total returns, percent of adjusted income, and percent of income tax charged accounted for by each bracket. Here are a lot of raw data. Look hard enough and you will find somethings you like and some things you don’t like. But, this is just one year, and it is the time trends that really matter. Previous Post Strong Economy? Give Me A Break!